No winter garden is complete without at least one witch hazel (Hamamelis spp.). These superb shrubs flower reliably during the harshest, bleakest of winters, scenting the air with their uniquely spicy fragrance. I featured this lovely yellow cultivar in a recent post, and remarked how the feathery, crinkled flowers reminded me of lemon zest. They smell equally delicious. The trick with witch hazels is to grow them somewhere that is consistently moist, but not wet. A sunny streamside bank or woodland glade would be perfect, offering moisture, shelter and good light. Should you not possess the right natural conditions, then you are setting yourself up for a lot of watering, as witch hazels do not tolerate drought. That’s a tall order for most of us, and added to that one needs neutral to acid soil and plenty of patience: witch hazels are not speedy growers although, in time, they can achieve the proportions of a small tree. E. A. Bowles, the 20th-century plantsman and garden writer, referred somewhat romantically to witch hazel as the Epiphany tree. This is the time when it commonly blooms, ‘with flowers of gold and scent of frankincense’. In fact there are varieties of witch hazel that bloom from autumn through to March, so chosen carefully one could enjoy a long succession of flowers in colours from pale yellow, through foxy orange to burnt red. For yellow flowers, two witch hazels I can recommend are Hamamelis × intermedia ‘Pallida’ AGM, one of the best sulphur yellow cultivars, and Hamamelis mollis ‘Wisley Supreme’ which has a lovely scent and canary yellow flowers. I have found that Hamamelis virginiana, the native eastern witch hazel of the US will handle less than ideal conditions very well once established. Given good water its first year, it will thrive given a spot with half-day sun in the morning and afternoon shade, in slightly alkaline (7.5) dry to medium soil without additional watering. And mine (about 8 years old) survived a serious 6 month drought with no additional watering and no apparent die back. They handle severe winters -15 fahrenheit (I think that is about -26 celcius) and they flower in October-November where I live near the Great Lakes until temperatures get too cold in December sometime. Beautiful lemon yellow flowers and light fragrance. Very hardy. Hi Dean. Thank you for all your insights. I believe many garden cultivars are grafted on to Hamamelis viginiana rootstock for precisely the reasons you outline – it’s tougher and more drought tolerant than other witch hazels, and more vigorous too. I imagine it gets mighty cold near the Great Lakes, but I would think it’s very beautiful. Maybe that’s why I’ve just bought my 3rd one! I must have lost my last two through lack of moisture. Maybe it’ll be 3rd time lucky! Incidentally, I chose a yellow flowered Hamamellis “Imperialis”, with its most gorgeous perfume. That’s a great tip thank you. Good luck with witch number 3! They are addictive, a bit like snowdrops and almost as expensive. It is difficult to stop at just one. I have 6 now, but I still keep seeing yet more that I really need. Sounds like a fabulous addiction Chloris. Cheaper than booze and cigarettes in the long term, I’m sure! 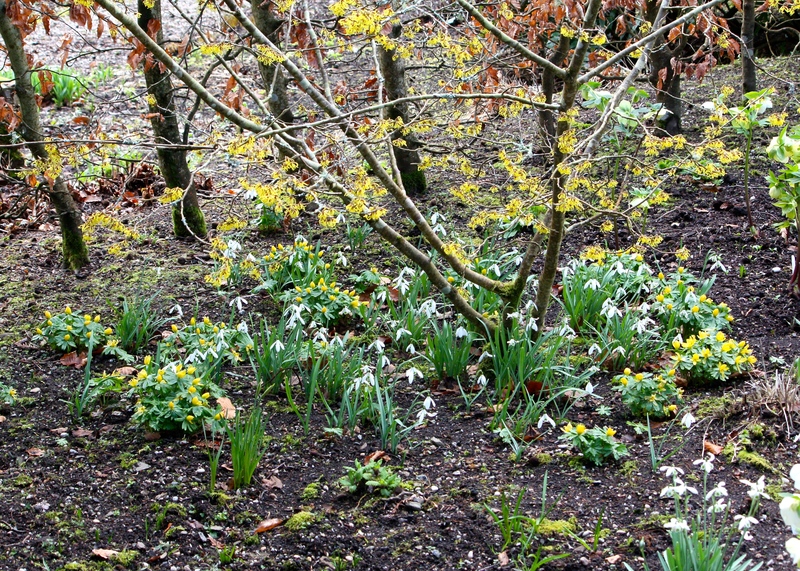 “Aconites and snowdrops make perfect companions for witch hazel” – how poetic! I love witch hazel too, it looked beautiful growing in the medicinal garden of the Royal College of Physicians where I last worked. Even in snow, the early golden flowers would peek out.